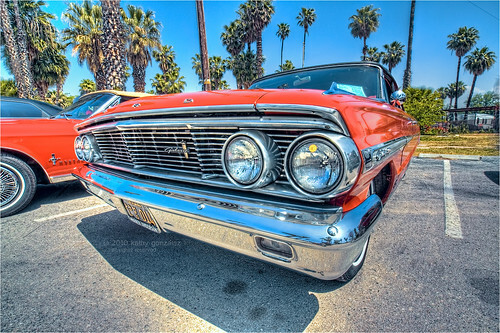 this was a sweet 1964 ford galaxie 500 at flabob airport's fly and drive show way out in riverside last saturday. owner was very proud of his baby, kept polishing it and brushing the dust off. it was kind of a windy day, but the light was just perfect for pictures. he explained about the manufacturer's plate on the front...says they're hard to come by with numbers that low. had found it at a swap meet or somewhere, and that he just puts it on for the show. you gotta do what you gotta do—first i've heard of that. guess it adds to the authenticity or old-timey feel? maybe adds to the overall collectability of an old car. i remember i asked him if he thought he'd win anything, as they were announcing last calls for votes. he didn't think so. maybe he figured there were other, better, more popular cars. as i mentioned before, i hung around for the awards, and doggone, if he didn't win a trophy after all. good on ya.